On June 20, 2016, Mukilteo City Council adopted the Japanese Gulch Master Plan. The adopted master plan provides a guiding direction to keep Japanese Gulch special while preserving and protecting the environment. This also includes plans for the 76th Street Trailhead to transition the former Highland Memorial Park into a park area to provide transition from the urban life to the Japanese Gulch Conservation Area. The master plan is organized in three different parts. Part I is a traditional Park Master Plan with background, design alternatives, references to public outreach, decision making process, and cost estimates. Part II is an implementation plan that provides additional directional information regarding stewardship, emergency services, and maintenance. Part III is the appendix with crucial data regarding public outreach, natural inventory, cost estimates, and level of service. If you are interested in hiking in Japanese Gulch please see the interactive trail map to find a path! Most of the trails in Japanese Gulch include rolling hills or switchbacks and can be muddy at times. The City of Mukilteo asks the users of the Japanese Gulch to respect the area and not to perform any work that has not received approval from the Planning Department. If you have any questions regarding this, please contact the Recreation Department at 425-263-8180 for more information. Mukilteo’s history of a passage port to the Snohomish River dramatically influenced the character of the settlement. The Mukilteo Lumber Company was established in 1903 and was later purchased by Crown Lumber in 1906. The lumber industry grew Mukilteo’s Japanese population to approximately 150 Japanese compared to approximately 200 Caucasian. 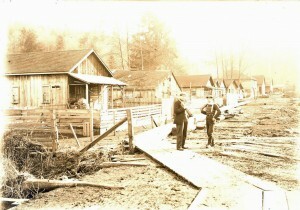 The lumber industry provided the Japanese workers housing in what is now the ‘lower’ Japanese Gulch. Following the closure of Crown Lumber Company in 1930, the vast majority of the Japanese community moved away. Following the incorporation of the City of Mukilteo in 1947, a portion of Japanese Gulch was incorporated within the city limits with a large portion within the City of Everett. Pieces of Japanese Gulch had been purchase by the City of Mukilteo for the use of a park over the last 19 years, but the last 98 acres of Japanese Gulch Park was purchased with the Snohomish County Conservations Futures Grant in February, 2014. It has been a grassroots effort, in large part headed by the Japanese Gulch Group that led to the purchase of the different parcels making up Japanese Gulch Park. The City of Mukilteo is currently working on developing a Master Plan for the Japanese Gulch Park that will function as a visioning document assessing the critical areas, uses, connectivity, historic significance, and design for generations to come. Sources: City of Mukilteo GIS Data, 2014, & Historylink.org Essay 8422 written by Marget Riddle December 29, 2007, revised January 10, 2011.